Today (October 25), exactly a week after they were elected to the helm of Nadigar Sangam, the new office-bearers will hold a meeting at a star hotel in Chennai, to discuss future course of action. “At the executive meeting, things such as renaming the Sangam, convening the general body meet and honouring legends such as Rajinikanth and Kamal Haasan will be discussed. The meeting will start in the morning and will go on till afternoon,” sources said. 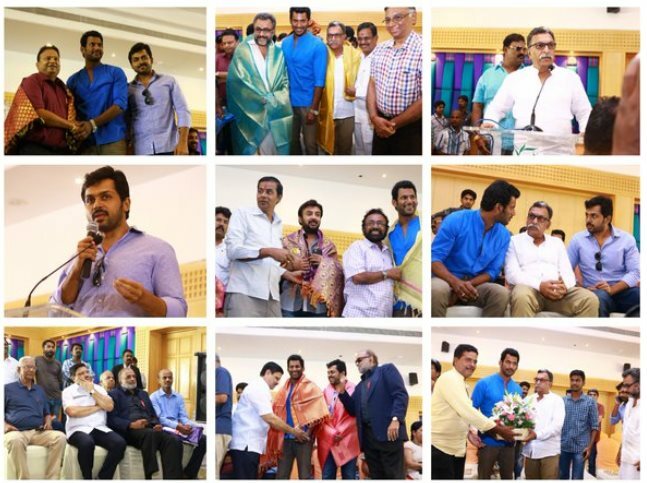 Winners of the Nadigar Sangam election, Pandavar Ani, formally took charge at the temporary office of the South India Artistes Association at T Nagar in Chennai on Monday. Earlier, president Nasser, general secretary Vishal, treasurer Karthi, vice-presidents Ponvannan and Nasser inspected the Nadigar Sangam property on Habibullah Road.